Where has this book been my whole life? After the disappointment of Empress of a Thousand Skies, it seems I found what I was searching for. Been searching for for months, really. In case you can’t tell, I loved it. So much. I was intrigued by the prologue. Despite the first chapter feeling a little slow, the book quickly picked up and really got good. And the world. I’ve been craving a good medieval-style fantasy world for ages, and I finally found one I love. The magic system was fascinating, leaving plenty of room for expansion in the rest of the series. Falling Kingdoms had very nearly everything I could want from a fantasy novel. It’s length was perfect, just over 400 pages (although I hope for the books to get increasingly larger). I’ve already touched on the world and magic system. It had a plot driven by politics, yet the politicalness (is that a word?) was handled spectacularly. The characters were handled well and were far from flawless. That’s what makes them so real, isn’t it? And what I loved the most was the way the book really did force you to choose a side. It was unique, to say the least. All-in-all, 4.5 stars. I loved it. 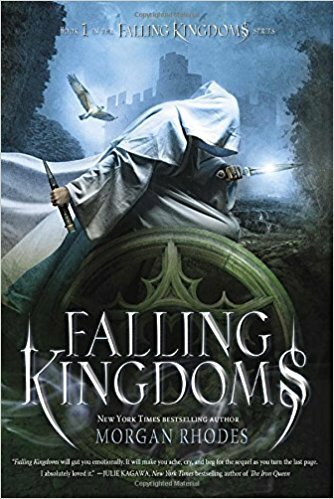 Falling Kingdoms wasn’t one of the best I’ve ever read, but it was a high fantasy I would certainly recommend. sounds like an interesting book! I think it’s on my GR to read. Hmmm, I think I will have to look into this one. The cover was done by Rebecca Treadway at atrink covers.